Known as "milk glass," for it's milky white color, and "hobnail" for it's dotted design, it was first made in the 16th century in Venice, was popular in the early 1900s, and made a resurgence in the 60s. It may have seemed tacky in the recent past, but it looks like hobnail is once again making a comeback in the form of lamps, mugs, vases etc. In the post I published last week on my Little Italy adventures, I mentioned going to a vintage store, where I found tons of hobnail milk glass dishware... I might just go back to snag a few items. If you like this look, here are a few cute pieces I've found online. 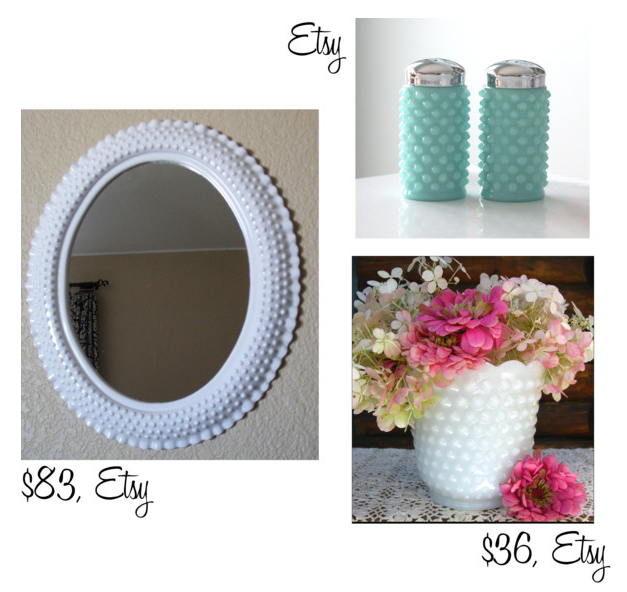 There wasn't much, which leads me to think that the best hobnail milk glass finds will come from thrifting. Milk glass makes me so happy. Seriously obsessed. So adorable! Old trends are definitely coming back in style! they are definitely coming back and Im happy! They are seriously so cute and I love the glass in a mint green! Have a happy Tuesday and be sure to enter to win sponsorship on my blog! . LOVE this style!! So timeless and chic - and super easy to find at thrift stores and antique markets!